Auto body shops have another incentive besides necessity to use General Motors’ paid OEM repair procedure site rather than the free one. 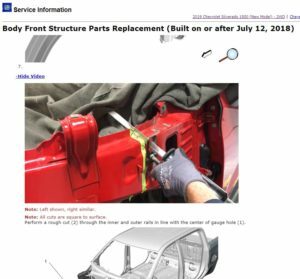 For example, the 2019 Chevy Silverado has a video showing the sectioning procedure of the “Body Front Structure Parts Replacing” in the collision repair category of the service manual. Another area where videos are present for the 2019 Silverado is the Engine Mechanical category. The 2019 Chevrolet Malibu has videos for Hybrid/EV Controls showing how to disconnect certain components of the high voltage system. I-CAR said other automakers also offer videos inside their repair procedures, referencing FCA, Honda and Kia. Of course, you’ll have to refer to the actual written OEM repair procedures as well to fix your customer’s car, not just watch the video and immediately close the browser window. (For example, a sectioning video we saw on for one Silverado front end was accompanied by additional illustrated and written context, such as the need to line up the cut with the center of a gauge hole.) But the videos are still great additions to an already upgraded repair procedure website. In other video resource news, Ford appears to have been stocking FordCrashParts.com with content, including films related to its revised certified body shop network and videos on the next-generation Expedition/Navigator and 2019 Ford Ranger. Finally, in still other Ford and GM resource news, don’t forget to check out the new issues of GM Repair Insights and Ford On Target. The first GM Repair Insights of 2019 dropped in January and can be found here. Volume 1 of the 2019 run of Ford’s On Target can be found here.